Jodi and Michael were looking to move to Vancouver Island where they could have easy access to enjoy their hobbies of mountain biking and skiing. They also wanted to build a new home to share with Michael’s parents, who are in their 70s. They researched the areas of Victoria and the Comox Valley, and chose the Comox Valley because of the close accessibility to biking and skiing at Mount Washington. They chose The Ridge development in Courtenay because they really liked the ocean and mountain views, the spaciousness of the neighbourhood and the walking trails. They felt welcomed by the friendly neighbours and they appreciate the lack of traffic noise and lack of light pollution. As well, the cost of building a new home to suite their unique needs was more affordable at The Ridge than it was in Victoria. The two couples wanted to build a duplex, with a custom design for their extended family's needs and they found the perfect duplex lot at The Ridge. They built a single-storey bunaglow on one side for Michael’s parents and a two-storey home on the other side for themselves. The two families are now happily settled in their new custom home at The Ridge built by one of their preferred builders, Lawmar Contracting. Contact The Ridge to register as a “prospective client” and receive more information about their next phase of lots, which will be available in late 2018. For more information contact, Bruce Clapham at 250.650.8588. Art Meyers, a licensed Realtor with Royal LePage in the Comox Valley has been representing Southwind Developments for over 10 years, as the realtor for these popular rancher/bungalow style homes at The Ridge at RiversEdge in Courtenay. 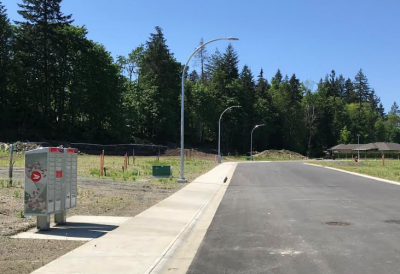 Ten new lots have recently received registration and 10 more lots are expected to be added to complete the lastest 20 lot subdivision on this 5.24-acre site located near the Puntledge River. Single-family homes will be built on these oversized lots. Two homes, built in a single-storey rancher/bungalow style, will be the first homes to be built on the site. The homes will range in size from 1,600 sq. ft. to 1,900 sq. ft. Construction of new homes is expected to begin very soon. 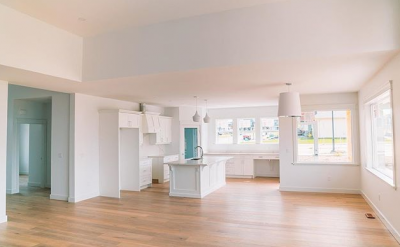 Contact Art Meyers for more information, plans and pricing on these beautiful new bungalow style homes for sale in Courtenay. Candor is one of the newest custom builders at The Ridge and they have a two-storey, 1,784 sq. ft. home under construction at 3399 Harbourview Boulevard. This home features open concept living on the main floor with 15’ vaulted ceilings in the great room. Upstairs offers three bedrooms, two bathrooms and a laundry area. This home has a completion date of September/October, 2018. Candor will be holding an open house, every Friday, Saturday and Sunday starting May 11 through June 3, from 12 to 4pm. Come by and tour this spacious, bright and elegant one-level home. At Candor Developments, owners Isaac Bale and Clayton Frank understand that building homes is more than just a process of construction. When working with a client to build their dream home, they strive to make that experience as easy as possible. Their homes are built with the same integrity, honesty and strength that their name suggests. Candor is a company built on 20 years of construction experience. Road works and site preparation are now underway for two new subdivisions in the Crown Isle Golf Course and Resort Community. 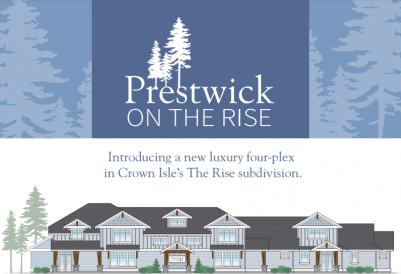 The RISE Phase III & IV (69 Lots total) are scheduled to be completed sometime in June or early July and the final extension of Crown Isle Drive - Cambridge Park Estates Phases V & VI (67 Lots total) - is following close behind, with registration expected in the late fall. Lot prices in The Rise start at $195,000, while lot prices in Cambridge Park Estates start at $250,000. 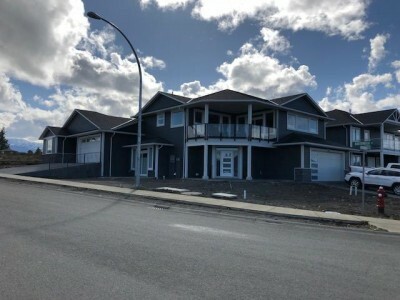 For more details on these and other real estate opportunities in Crown Isle, contact Jason Andrew, Director of Real Estate, or Bert Jaeger, Realtor for Crown Isle Realty Ltd. Both Jason and Bert are true experts in the Crown Isle Community, having both started their careers at Crown Isle as golf professionals nearly 20 years ago before moving into the Real Estate Division. They live, work and play golf in the Crown Isle Resort and Golf Community and know about everything it has to offer. Between them, they have 40 years of combined experience working for Crown Isle, and are familiar with the community history as well as what is planned for the future. No one knows Crown Isle like they do! It's spring on Vancouver Island and that means flowers are blooming! One particular plant in the Town of Ladysmith is gaining international attention. The more-than-a-century-old shrub, locally known as “Lady Cynthia,” has been attracting international acclaim and visitors after it was listed as one of the most beautiful trees in the world by a number of online publications last year (even though it’s not technically a tree). 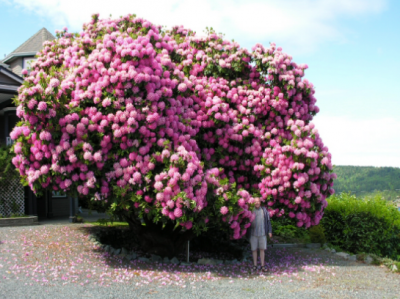 This massive rhododendron has been blooming on the same hilltop since 1889. For most of the year, Lady Cynthia just looks like a large, green shrub. But, for approximately two weeks in early May the rhododendron becomes a remarkable sight when it reaches full bloom. Now that it’s in full bloom again, the Town of Ladysmith, B.C., located on the east coast of Vancouver Island, is preparing for another influx of tourists. Tourists visiting Ladysmith can also enjoy beachcombing, walking trails and the historic downtown, all of which are stunning in the spring sunshine! 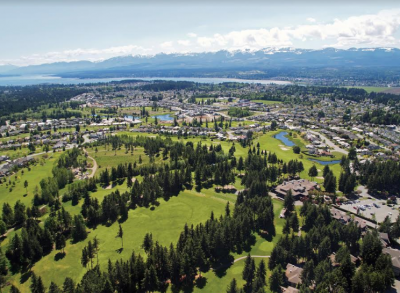 Residents of Ladysmith can enjoy all of this beauty and more, year-round. Establish your roots at the Gales in Ladysmith and plant your own spring garden with a view of the ocean. The luxury townhomes at The Gales offer spacious designs and luxury finishings. Generous balconies and patios offer sunny ocean and mountain views. Unit 17 is new a 2,600 sq. ft. 3-bedroom home currently listed for sale at $649,900. Budget Blinds in the Comox Valley is offering 50% off Norman-brand shutters this month. 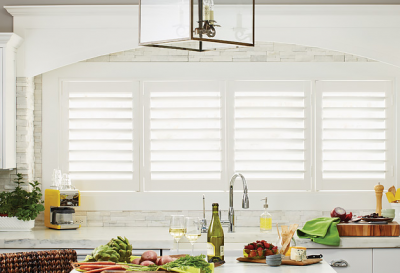 With a free-in home design consultation you’ll find the perfect shutters for your home. Whether you prefer wood or faux wood shutters, composite or vinyl shutters, you’ll find that Budget Blinds’ Norman shutters complement any type of window or interior design style. Window shutters can be customized in many different ways. In addition to being available in a wide variety of natural wood colours, these window treatments can also be custom colour-matched to wood furnishings in your home. You can choose interior shutters to fold up accordion-style to one side of the window or to slide out of the way and stack on the side of the window. Or choose a traditional design on hinges that swing inward. Or request a free in-home consultation online.